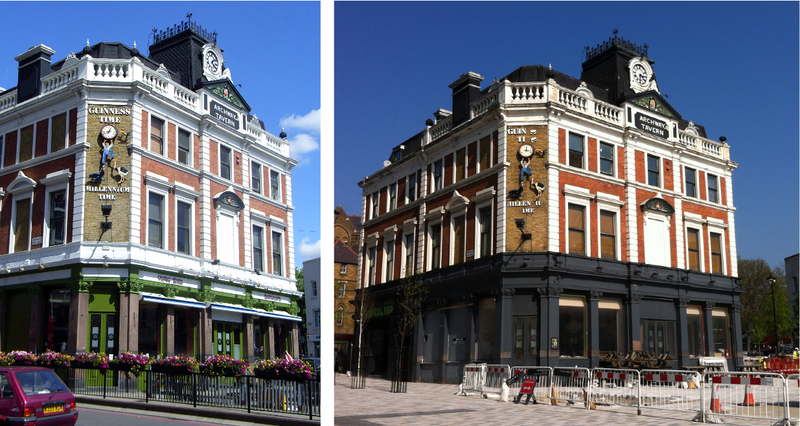 Jane's London: Archway Tavern, N19 – Save the Guinness Sign!!!! The Archway Tavern building we see today dates from 1888. 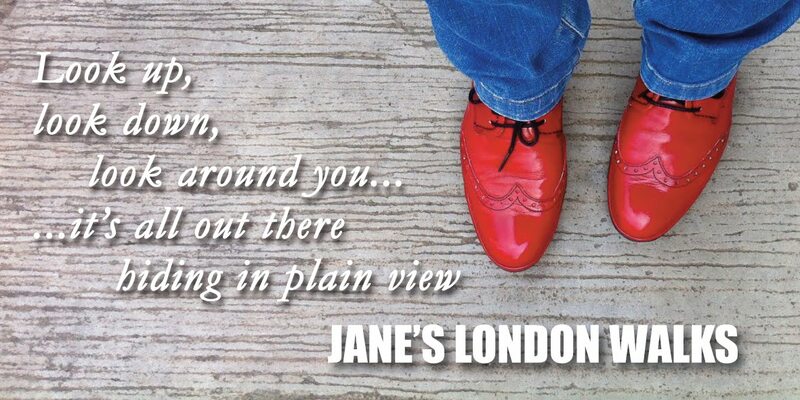 It looks down Holloway Road towards the City of London. In 1971 its interior featured on the cover of The Kinks' Muswell Hillbillies album. 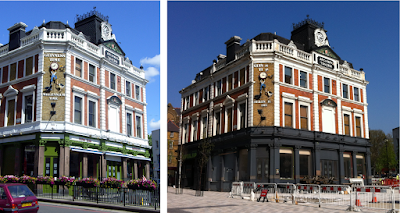 Over the past few years the pub has stood empty. The ground level was painted a sombre black when the pub was being renovated in preparation to be reopened a few years ago. But work ceased. However the upper floors are available to hire as a nightclub venue accessed by a staircase at the rear. As you can see by my comparison pics above, the surrounding pavements have recently been extended and remodelled to create an open piazza area. Judging by all the articles in the local press this has caused a lot of 'stress' and 'upheaval' for people confused how to navigate the junction as the building work progressed. The people of Archway don't like change. Grump grump. Harrumph harrumph. Pedestrians have been getting all angsty as bus stops were moved and then moved again and motorists complained about not being able to navigate what used to be a roundabout. They are probably all still complaining now. And will continue to do so. But hold your horses here people!! Back in the day this was never a roundabout in the first place. See right. Ditto Highbury and Islington roundabout, but that's another story. I think the end result will be good for the area, not least of all for the shops and businesses in Archway Close that were as good as stranded on an island. The building work is now almost complete and I have already made use of excellent pedestrian crossings from Archway Road, St John's Way and Holloway Road into the piazza and Archway tube station. My only concern is that the new cycle paths that cut through the zone may cause a few problems; the cyclists, not the cycle paths. Look at the Millennium Guinness sign on the corner of the building and see how during the last nine years bits of it have fallen off. 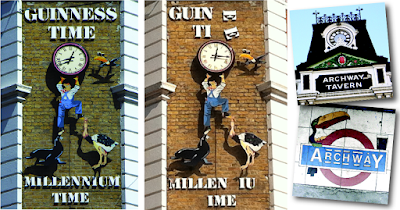 Photos of the Guinness sign in 2008 and 2017. 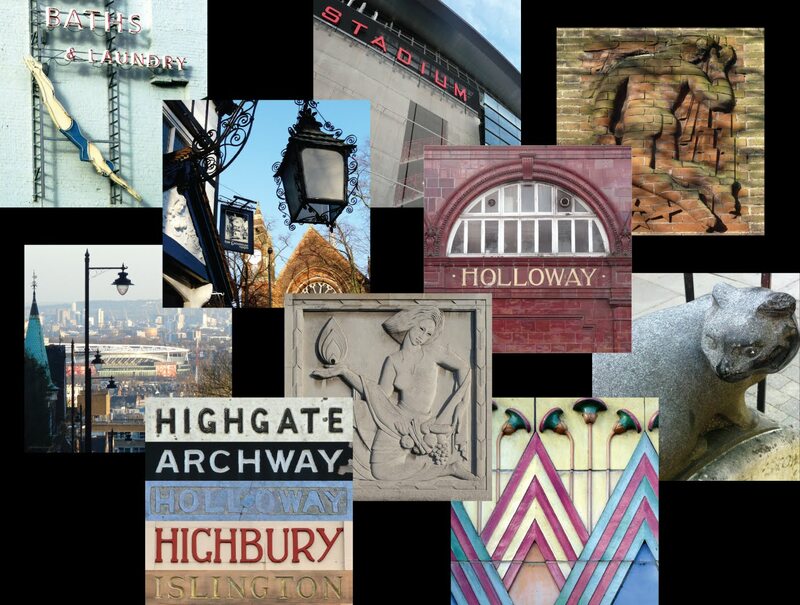 Available as a greeting card along with these other two also from the Archway Tavern. The sign on the Archway Tavern was erected for 2000 and if you study it you can see it is a bizarre and not very animal-friendly image. It shows a workman, or possibly a clock repairer (or clock thief?! ), standing on the nose of a seal and the beak an ostrich (which has a pint glass stuck in its throat) as he reaches up to the clock, with a toucan flying in from the right balancing two pints of the black stuff on its bill. It all looks rather precarious. But I love it. I am hoping that when the pub opens again the new owners will see fit to replace the missing letters on the sign. Signs such as theses this become iconic local landmarks. 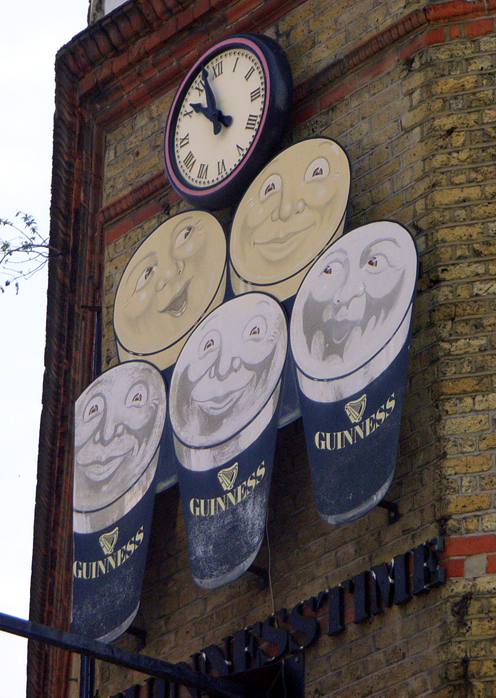 Many have disappeared from our streets over the years including one that used to be on York Way opposite the end of Agar Grove – it had five happy Guinness pints under a clock. An assessment of the sign here. See also the Guinness collectors' site. You describe "an ostrich (which has a pint glass stuck in its throat)". That's because "The Ostrich, travellers recall, enjoys his Guinness glass and all". 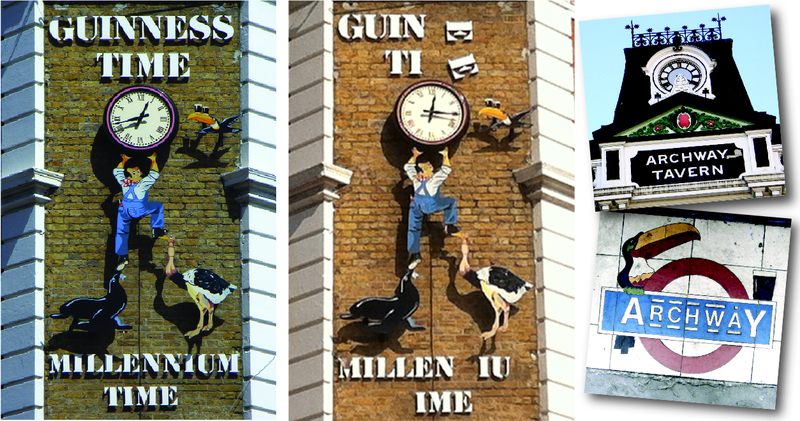 Which is how the Guinness ostrich was depicted.